Amnesty International in France is turning up the heat on the death penalty, with this television commercial directed by Pleix, a community of visual effects artists, designers and musicians based in Paris. 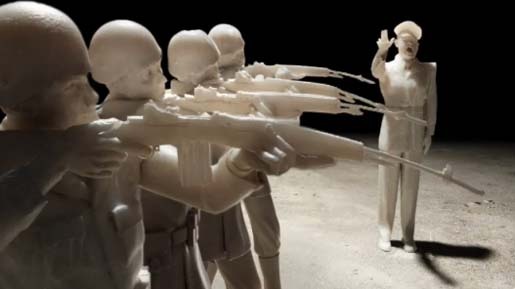 Heat applied to a series of wax tableaus melts a firing squad, a gallows, a swordsman, an electric chair, leaving just the emblem of Amnesty International, a burning candle. Each of these four executions represent an area or country in the world – shooting (China, Libya, Syria, Viet Nam, Yemen), hanging, Bangladesh, Botswana, Egypt, Iran, Iraq, Japan, North Korea, Malaysia, Singapore, Sudan, Syria), beheading (Saudi Arabia) and electrocution (USA). Death to the Death Penalty was developed at TBWA\Paris and TBWA\Else by creative directors Eric Holden and Remi Noel, creatives Benoit Leroux and Philippe Taroux, and agency producer Maxime Boiron. Filming was shot and edited by Pleix via Warm & Fuzzy Productions and Gang Films. Post Production was done at Digital District. Initially, TBWA Paris and Pleix wanted to create the entire spot in camera, shooting real statues created out of wax. But in initial tests it was discovered that it was too difficult to shoot melting wax without it looking like stop-motion, so the film was almost completely done in CG except for a few live action elements. As with all Amnesty International campaigns, this film was created on a voluntary basis. The French collective Pleix, represented by warm&fuzzy in Paris, worked with Parisian post-house Digital District for several months on this CG tour de force to create the photo-real melting of wax. Music is “Everyday”, by Carly Comando, the piece used in Noah Kalina’s “Everyday” photographic montage.